This paper offers a survey of hymn collections in Scottish Presbyterian use before the publication of The Church Hymnary in 1898. That book was prepared by a joint committee of the Church of Scotland, the Free Church of Scotland, the United Presbyterian Church of Scotland, and the Presbyterian Church of Ireland, and was sanctioned for use in those Churches Footnote 1The United Presbyterians joined with the Free Church in 1900, becoming the United Free Church, which in turn, under assurances and safeguards, combined with the old Establishment to form a reunited Church of Scotland in 1929. An earlier reconciliation is also noticed in the text. . The Irish Church had not hitherto used hymns in public worship. The other Churches had each an excellent hymn-book, and the experience of previous collections. The United Presbyterians had a long tradition of hymn-singing. They were strong in the cities and towns, weaker in country parishes, and scarcely represented in the Highlands and Islands (except the Orkneys). The other Churches were national Churches; they made a later and hesitating start, but their final hymn-books are fine collections. Musical knowledge increased; organs were coming in, in the last third of last century. Dr. Jerdan of Greenock had a story of an old woman, describing her young minister’s service: “Ou aye, he sings, an’ prays, an’ sings, an’ reads, an’ sings again, and pits bye the time wunnerfu’”. These were only “preliminaries”; the essence of the worship was the sermon. That had been the old idea; but Praise now began to take a bigger place in Church Service. The revised edition of the Church Hymnary (R.C.H. ), now in use, was issued in 1927 in anticipation of the Reunion two years later. It contains an element of hymns inserted at the desire of the Welsh brethren on the Committee, hymns which had formerly been used in Scotland and had dropped out of use. Insofar as the revised book was designed also for service in England, that fact is noticed elsewhere in this series under English Presbyterian hymnody. For the present, however, our main interest is in the streams which found their way into the river of the 1898 collection. The article in Julian on Scottish Hymnody, by James Mearns, gives the story, with facts, dates and figures, and the full titles of the books. A tabular summary now follows. Examining these books is a kind of Meditation among the Tombs. They are all dead books, or nearly all. One recalls the late Lord Rosebery’s comparison of a library to a cemetery, an assemblage of the dead. But the seed when it dies bears fruit. The different sequences in columns 1 to 3 show hymns and ideas handed on, developments and amendments. The numbers shown in col. 5 exclude doxologies, etc. ; some of the books had a group of doxologies added, with separate numbering. Col. 6 gives the number of hymns retained in the next book of the column series. Col., 7 gives the number represented in R.C.H. 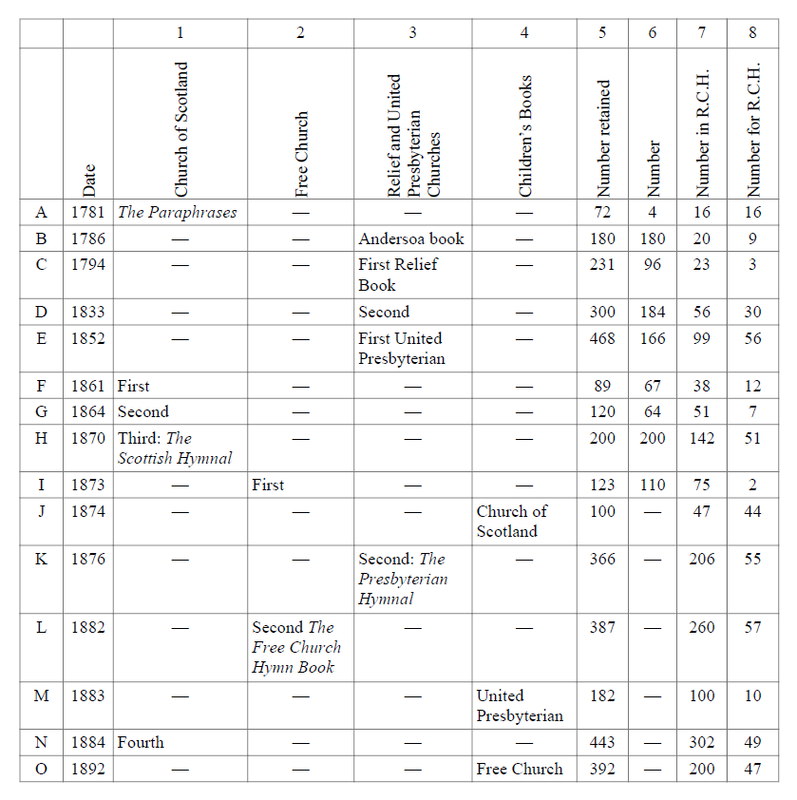 The last column shows the contribution which each book made, the hymns now in R.C.H. which entered then into Scottish Presbyterian use, just as it is noted in the text when some well-known hymns came into such use. The number of Scottish hymn-writers is not large; most of those represented in these books are mentioned by name. A. The Scottish Paraphrases number 67, arranged in Scripture order, with an appendix of five Hymns. The pieces are all in common metre, except six in L.M. (two in the appendix). As in the Scottish Metrical Psalter, these bear no indications of authorship; the book is the work of a committee. Hymns by Watts and others have been revised and altered, and in more than one case the result is practically a new composition. The collection is printed at the end of Scottish Bibles, following the Metrical Psalter, and is still in common use. Scottish Presbyterians hold it in deep respect and affection, and regard it as a typically Scottish institution. B. Five years after the Paraphrases were issued, James Steuart, minister of Anderston Relief Church, Glasgow, published a collection of hymns for use in the worship of his congregation., There have been a number of such collections, but his is the first in Scottish Presbyterianism. The book opens, like the Paraphrases, with three hymns on the Creation. (This is habit, for the old general prayer in a service started at the Creation.) But thereafter the only apparent principle of arrangement is that blocks of hymns succeed by the same author or authors. No. 1 is by a woman writer, No. 3 is Addison’s “The spacious firmament”. No. 2 is the Watts hymn which was amended as Paraphrase 1—in ten others also Steuart preferred Watts’s original hymn to the version in the Paraphrases. No. 4 is Watts’s first essay in hymn-writing, “Behold the glories of the Lamb … Prepare new honours for His Name, And songs before unknown”. It introduces a large block of his hymns, Nos. 4-86, including “When I survey”. A second block, Nos. 87-108, is from the Paraphrases, adding, as 109, Addison’s “When all Thy mercies” from the Paraphrases appendix of Hymns. He omits, among others, the familiar Communion Paraphrase 35, as well as 37 and 58. Then Nos. 110-124 are from the Olney Hymns, mostly Newton’s but with Cowper’s “Hark, my soul, it is the Lord”. It looks as if Steuart had these three books before him. There is one more (No. 126) by Newton, 11 at least by Watts, distributed. He. would have other books to draw from, probably Ash & Evans, and almost certainly Madan’s Collection. There is a group of five together by Anne Steele (Nos. 149-153) and three others by her are scattered about, with two by Elizabeth Scott. The remainder include a group of three by Doddridge, 13 of his in all; four by Joseph Hart and four by Charles Wesley. Outside the authors of Paraphrases I have not found any Scottish author in this book. There is a version of Scheffler’s “Liebe, die du mich zum Bilde”, now used in the version by Catherine Winkworth (R.C.H. 496. Rev. A. & M. 203). I judge that Steuart was not interested in authorship; his aim was to give his congregation a praise-book, and help them to sing a new song to the Lord. Julian (p. 710) describes Madan’s Collection as “170 hymns thrown together without order or system of any kind”: that description fits the three Relief books. Most of the hymns are in common or long metre; but there are three in S.M., four in 7’s, ten in 8 x 7’s, and one 6666 88. C. Eight years later, the Relief Church sanctioned the use of a hymn collection which consisted of the Anderston book with 51 hymns added by Patrick Hutchison, minister at Paisley, a leader in the denomination. The preface by him is a defence of the use of hymns in public worship. His additions are all in common or long metre. They begin with two Communion hymns. He adds 20 by Watts, four by Newton, one by Cowper, five by C. Wesley (“O for a thousand tongues”), and a version of Pope’s Messiah in L.M. Fourteen are from Psalms, or Hymns (1777) by Alexander Pirie, successively Anti-Burgher, Burgher, Relief and Glassite minister. Again leaving aside the Paraphrases, he seems the only Scottish author in the collection. His hymn, “With Mary’s love, without her fear”, used to be sung at Easter time in this writer’s boyhood. But the Church is rich in hymns of the Resurrection. Two-thirds of the book is the work of English Independent hymn-writers. Authors’ names are not noted. Each hymn has a short title or description, with a Scripture reference: e.g. CX / Walking with God / Gen. 524 / “Oh. for a closer walk with God”, There is a full Index of Topics, and a Table of Scripture Texts, providing an elaborate classification of the hymns. These were supplied to the books also which follow in this series; indeed, every effort was made to assist ministers in their use of these books, except the obvious sensible plan of arranging the hymns themselves in order of topics. The Relief Church was one of the smallest of the Presbyterian Churches; it had then forty congregations. D. After a generation had passed, it issued a revised book. 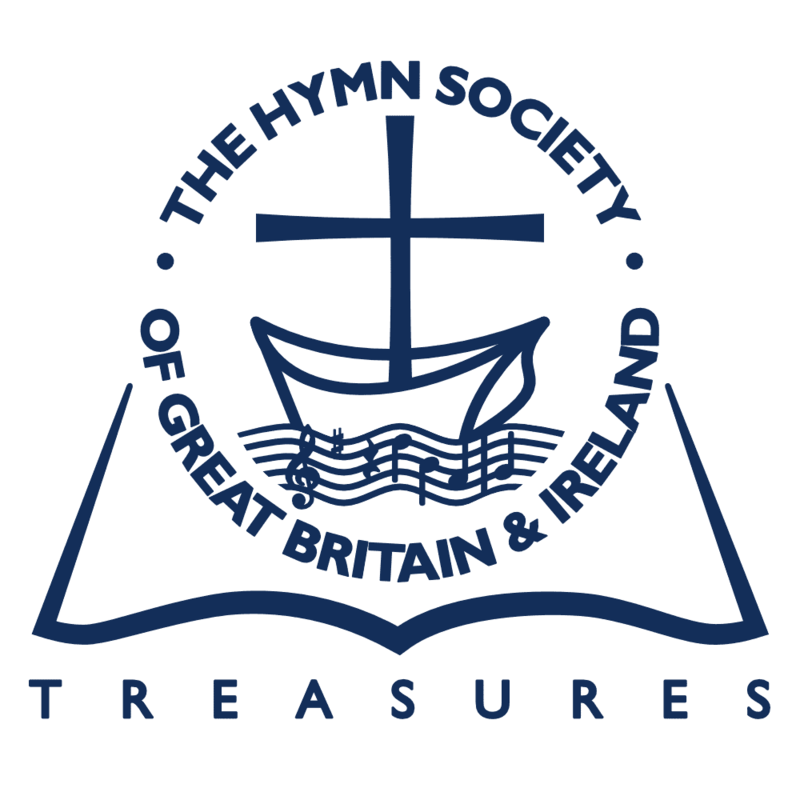 Hymns retained kept their original numbers; new hymns replaced those omitted, and the total was increased, Hutchison’s defence of hymn-singing was retained. The preface goes on to announce that “in a few instances not only expressions but sentiments of the original hymns have been changed. The greater number of these alterations have been adopted from other judicious editors of hymn-books”, “Rock of Ages” is given in the 3-stanza form, with the sixth line, “Save from wrath, and make me pure”. This is in the 1861 Church of Scotland book also. This article could be filled with notes of hymn alterations, most of which have not found acceptance. Fifty paraphrases are included, and four of the added hymns. The index adds name of author. Missionary hymns enter and take their place — “O’er those gloomy hills of darkness”, “Jesus shall reign”, “From Greenland’s icy mountains”. Fresh names appear, old and recent, Milton (“Let us, with a gladsome mind”), Ken’s Morning and Evening Hymns, Harriet Auber (“Our blest Redeemer”), Montgomery (“According to Thy gracious word”), Williams, Heber, Edmeston, Walter Scott in a cento from Rebecca’s hymn in Ivanhoe. There is greater variety in metre, seventeen besides common and long. E. In 1847 the Relief Church with 118 congregations joined the United Secession Church with 400, to form the United Presbyterian Church. The Relievers brought their hymn-book, and the Seceders a book in the making. Their draft of 1844 had 946 hymns; one section of 30 hymns for the young included “Saviour, like a shepherd lead us”, “Great God, and wilt Thou condescend”, “I think, when I read”, The first hymn, and Andrew Young’s “There is a happy land”, were admitted into the book of the United Church. It has fifty Paraphrases and three of the added Hymns. Metres are still more varied, thirty besides common and long. Among new names are Dryden, in an extract from his Veni Creator rendering, Wardlaw, McCheyne, Cennick, Kelly, Charlotte Elliott, Milman, Lyte, Doane, Keble (“Sun of my soul”). There are 23 by C. Wesley, three verses of “Jesus, Lover of my soul”, four 4-line stanzas of “Hark, the herald angels sing”. “Rock of Ages” is in the customary form, except for “When I soar to worlds unknown”. Each hymn has a title, and Scripture references, usually three. Hymns are arranged in order of their first Scripture reference: No, 1 is Montgomery’s “Songs of praise the angels sang”, with Gen. 1, Luke 2:13,14 Col. 3:16. F. Eighty years after the Paraphrases were published, the Church of Scotland gave permission for the use of a small selection of hymns, which was later revised and enlarged. The 1861 book introduced the hymn for a service of infant baptism, by William Robertson, minister at Monzievaird, “A little child the Saviour came”; Jane Borthwick’s translation from the German, “Be still, my soul”; a hymn by J. Ross Macduff, minister in Glasgow; C. Wesley’s “Love divine, all loves excelling”; and Lyte’s “Pleasant are Thy courts above”, given as “ Glorious are…”. The book has other alterations, which have not been accepted: as “Jesus, Refuge of my soul”, “Sun of the soul, Thou Saviour dear”, There are 11 metres besides common and long, one described as C.M. with Repeat, 86866, which would be suited by the repeating tunes then popular. No ordered arrangement of the hymns is followed. G. In the next collection hymns were now at last arranged in order of subject: God; Christ; The Holy Spirit and Trinity; The Christian Life, 46-97; Baptism (Robertson’s “A little child”), The Lord’s Supper (Montgomery’s “According to Thy gracious word”), The Lord’s Day, 98-101; Missions; Miscellaneous. This scheme was adopted, with modifications, in the subsequent collections except (L). New hymns include Sarah Adam’s “Nearer, my God, to Thee”, and Lyte’s “Abide with me”. H. The use of these books was limited; but the third, published in 1870 as The Scottish Hymnal, won general acceptance. The Church of Scotland began to be a hymn-singing Church, and to have justifiable pride in its hymn book. A section, “Hymns of Natural and Sacred Seasons”, includes two on Baptism, five on The Lord’s Supper, and five on Church and Ministry. Hymns of other countries and languages are drawn upon, renderings by Neale (“Jerusalem the golden”, “Art thou weary”), Ray Palmer (“Jesus, thou Joy of loving hearts”), Catherine Winkworth (“Whate’er my God ordains is right”), translations of “O Haupt voll Blut”, and “Ein’ feste Burg”, of the Veni Creator and Veni Sancte Spiritus, and the Dies Irae. The book ends with a rendering of the Te Deum. Other new hymns include “Come, ye thankful people, come”, “Eternal Father, strong to save”, Heber’s “Holy, holy, holy”, Newman’s “Lead, kindly Light”, and three by Horatius Bonar (“I heard the voice of Jesus say”). A short Scripture quotation is prefixed to each hymn. I. The first Free Church collection included forty paraphrases, some curtailed. Music is given in cut-leaf form. The selection of hymns was judiciously made; but their number was small. The only hymns for our last column appear to be Caswall’s translation “Jesus, the very thought of thee”, and a hymn by C. Wesley “Weary of wandering from my God”. The book included 21 new psalm versions, in varying metres. The proposal to revise the metrical psalter has again come up in Scottish Church courts recently. Dr. Millar Patrick has a chapter on this in his Four Centuries of Scottish Psalmody. J. The Churches in turn published books for use in their Sunday schools. The Children’s Hymnal (not seen by the present writer) was issued in a words only and a melody edition; an edition harmonised by W. H. Monk followed in 1881. Mary Duncan (“Jesus, tender Shepherd, hear me”) and J. Drummond Burns (“Hushed was the evening hymn”) are Scottish authors. 200 Sacred Melodies, Bateman and Inglis, was then much used in Scottish Sunday schools (Julian 2nd Ed. 117 i). The Union Hymnal was issued by Glasgow Sabbath School Union in 1877, with 182 hymns; a later edition had 223. It was succeeded by the Scottish National Hymnal for the Young, issued in 1891, still in use in Glasgow and the west of Scotland. The 11th edition of 1937 has 201 hymns. K. In 1870, when the United Presbyterian Church was considering the revision of its hymn book, the other Churches were approached with the proposal to make a common hymnal. The time for this, however, had not yet come. The Presbyterian Hymnal was smaller than its predecessor, an unusual result. Church books swell, new hymns requiring admission and old hymns finding advocates. No paraphrases were included, that collection being otherwise available for congregations. Fewer than half the pieces in the previous book were retained. The hymn titles and Scripture references of the previous books were omitted. In their place Scripture texts were inserted, as in (H), Hymns are now arranged in order of topic, and classified elaborately. The section on the Redeemer has 72 hymns, and that on the Christian Life 115. “Abide with me” is classed as a hymn for the close of life. There are besides five evening hymns. There is a section of five Ancient Hymns, including the Te Deum, Neale’s translation of the Cantemus cuncti, “The strain upraise of joy and praise”, and a rendering of the Dies Irae by William B. Robertson, minister at Irvine. Other ministers of the Church were contributors, Hamilton MacGill, William Bruce, George Jacque. There is a section, “Hymns for the Young”, with 27 hymns. Six Winkworth translations include her renderings of the Nun danket and Wachet auf. Thomas Carlyle’s translation of Ein’ feste Burg was chosen. Nine hymns by Bonar include his “Here, O my Lord, I see thee face to face”. Other names are Anne Cousin (“The sands of time are sinking”), Newman (“Praise to the Holiest in the height”), Christopher Wordsworth (“O day of rest and gladness”), Thring (“Saviour, blessed Saviour”), Ellerton (“Saviour, again to thy dear dear name we raise”). Fidelity was sought to the original wording of hymns. The refrain of Milman’s “When our heads are bowed with woe” is given as “Gracious Son of Mary, hear”. Other books in our list have the hymn, each with a different refrain. C. Wesley’s Christmas hymn began “Hark! how all the welkin rings”, But the last verse of “Art thou weary” was left out. The following year, 1877, an edition was published with fixed tunes, being the first Presbyterian hymnal with fixed tunes. The other Churches followed this example. L. The Free Church Hymn Book with Tunes shews marked advance in the decade which followed the former meagre selection. The Moody and Sankey revival of 1874 was a hymn-singing revival. Many Free Church ministers and members became reconciled to the use of hymns, and even of organs. The book has an artificial arrangement, hymns being printed in order of metre, beginning with long and common. There is a full index of subjects. 53 hymns are marked as for the Young. There are extracts from 20 paraphrases. The Church profited from the experience of its neighbours, and borrowed hymns found helpful; last come, best served. The collection has also a large number not included in the books previously considered. Classed under The Communion of Saints, are “For all the saints, who from their labours rest”, “Onward, Christian soldiers”, “The Church’s one foundation”, “Through the night of doubt and sorrow”, Under the heading Catechumens: “Jesus calls us; o’er the tumult”, “O Jesus, I have promised ”. M. The Presbyterian Hymnal for the Young was the United Presbyterian contribution to the needs of its Sunday schools. It included 77 hymns from the parent book. N. The Scottish Hymnal was more than doubled in size by additions approved by the General Assembly of 1884. New features included a group of Passion Hymns, one of each of the Seven Words from the Cross; a group for First Communion; and a group for the celebration of Marriage. There is a section of 86 Hymns for the Young. Hymns by ministers of the Church include “Courage brother! do not stumble”, by Norman Macleod, and “O Love that wilt not let me go”, by George Matheson. O. The last book on our list, The Home and School Hymnal, was prepared by a committee, convener James Bonar, nephew of the hymn writer, and published with music revised by Barnby. It had a larger scope than the Sunday school books noted under (J) and (M); it sought to provide “a manual of devotion for the family… for Sunday and day schools, Senior classes, Church and other Services for the Young, Mission Services, and several Special Occasions”. In 1891 the Synod of the United Presbyterian Church resolved to revise its Hymnal. Negotiations were again opened with the other Churches with a view to their co-operation. They approved of the project of a common hymnal. The work went forward; and ultimately The Church Hymnary was accepted by the Churches. Figures are given by Dr. Alexander Henderson (in Dr. Brownlie’s Hymns and Hymn Writers of the Church Hymnary) to shew ‘how far The Church Hymnary agrees with the hymn books in use in the three co-operating Churches. (K to O in our list). Excluding doxologies, etc., there are in all 625 hymns, of which 172 are in all the books, 128 are in two, 198 in one (119 in Scottish Hymnal alone, 33 in Free Church books alone, 46 in United Presbyterian books alone), leaving 127 which are new to all’. The only book between 1898 and 1927 that calls for notice is the Scottish Mission Hymn Book, published in 1912 by the Church of Scotland. It contained 341 hymns, with eleven Psalm extracts and 9 from the Paraphrases. It was judged a failure, an unsuccessful effort to combine Bach with Moody and Sankey. Some elements from it were admitted to R.C.H. The books here surveyed have all, except (A) and possibly (N), fallen out of use. In their day they served the Lord and His Church, and helped forward the praise of His people; each prepared the way for its successors and their service. 1. ^Footnote 1Jump back to footnote 1 in the text The United Presbyterians joined with the Free Church in 1900, becoming the United Free Church, which in turn, under assurances and safeguards, combined with the old Establishment to form a reunited Church of Scotland in 1929. An earlier reconciliation is also noticed in the text.